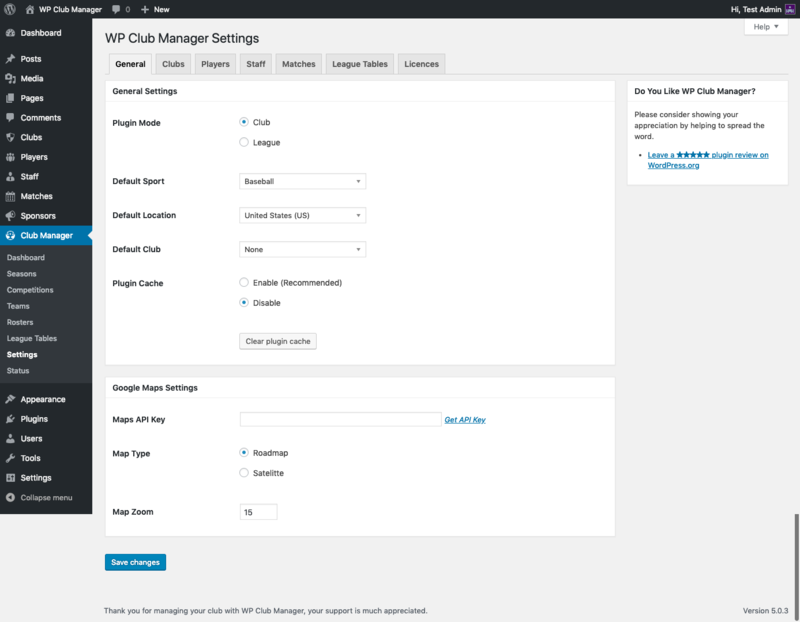 To edit the general settings go to Club Manager > Settings. Choose between Club and League Modes. Choose your sport. Your choice of sport will ensure that the correct preset player stats and sport specific match functions are available. Choose your default club. If you have already created your club then select that club from the dropdown box. This is your club. If you have multiple teams they will all be part of the club your choose here. You must set a default club if in Club Mode! Choose your base country. The selected country will be the default choice on player and staff profile pages, saving you a little time when compiling profiles. The plugin cache speeds up the front end display of shortcodes and widgets by storing the HTML output in the database rather than making queries each time a shortcode is viewed. We recommend this is Enabled. If you encounter any problems you can Clear Plugin Cache to delete the cached plugin transients. Choose whether to display Roadmaps or Satelitte images. Choose a zoom level for venue maps.